COLONEL KURTZ (on tape): I watched a snail crawl along the edge of a straight razor. That’s my dream. That’s my nightmare. Crawling, slithering, along the edge of a straight razor, and surviving. No doubt the President was on razor’s edge with this close election. Maybe now we can go to a popular vote and eliminate the electoral college? 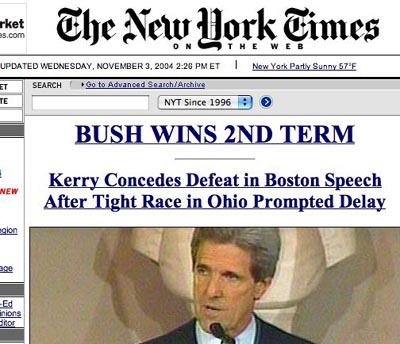 Bush won the popular vote.